Keep each other warm with some coffee on your chilly hike! There’s nothing like a freshly brewed cup of hot coffee that can really get you going in the morning. But having your caffeine to go can be difficult if you don’t have the proper to-go mug to keep you moving! If you’re one of those people who likes to enjoy a hot drink like a cup of Joe multiple times throughout your day, only an insulated mug or vacuum flask will do to get you through. Whether you prefer your drink hot or cold, there are a whole lot of choices out there for you to review that offer decent vacuum insulation. So, before you make your decision, we want to make it easy for you to get right down to the best thermos travel mugs, thermos bottles, and thermos flasks for keeping coffee hot! Believe it or not, there are options available on every budget and you won’t have to search much longer for the ideal way to ensure you can have the perfect cup of coffee at the ideal temperature whenever you need it. Offered in both 12 and 16 oz. sizes, the ﻿﻿Zojirushi has a trademark “Slicksteel” finish that feels good in the hand and a secure snap closure lid that will prevent spills of all kind. The lid operates in a gentle two-step process and it eliminates the “flying condensation” that sometimes happens when you open certain bottles for a drink. There’s even an air vent inside the lid that allows the liquid to stream out easily! If you’re into a more vintage vibe, you’ll probably love the look and style of the Stanley Vacuum Bottle! With five different sizes and two classic colors to choose from, each size will keep drinks hot and cold for varying lengths of time. For example, the 25 oz. thermos bottle will keep your coffee or tea as hot as can be for up to 20 hours while the 16 oz. bottle will keep your coffee hot for 15 hours. There’s only a slight difference in price and any of the available options would be a great buy. The vacuum insulation is what allows for such lengthy heating times and, one of the best things about this particular bottle is the fact that the lid doubles as a cup that you can drink from. This baby won’t leak even a little bit and it’s easy to throw into your gym bag. The sleek stainless steel body easily resists rust, and the solid drink chamber resists flavors and odors and rinses clean. That powder-coated finish is one that the Stanley brand is known for and you just can’t go wrong with this one. If you’re looking a large-capacity bottle that will keep your coffee hot for a full 24 hours, you won’t want to pass up the Thermos King. It holds 40 oz. of your favorite drink and it will always be just as hot as you like it once you take a sip. Condensation is never an issue here and the stainless steel construction looks and feels good in the hands. The sturdy handle makes it easy to travel with and it can fit into most tight spaces without taking up very much room. The lid itself doubles as an insulated cup that you can use when you’d rather pour up a drink to enjoy. 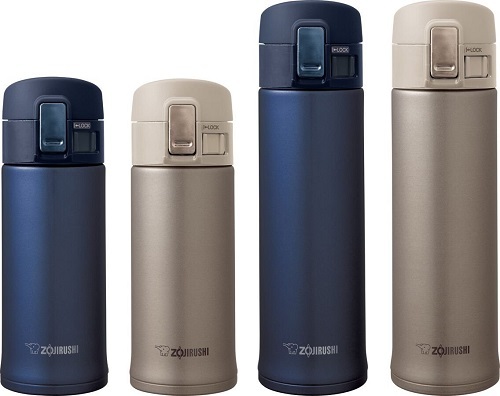 The innovative cap design is probably the most notable thing about this very stylish Thermos. It has a “twist and pour” functionality that allows you to pour out a drink without moving the stopper at all. If you ever happened to drop this bottle, you could feel secure knowing that it would sustain very much damage—and that makes the price point that much more attractive! 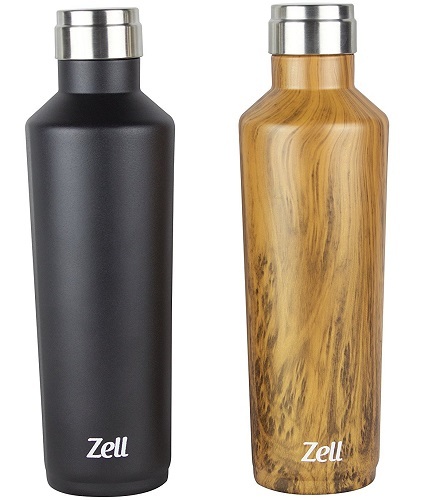 The stylish design of this bottle is reminiscent of a water bottle, but it can hold you hot liquids and keep them hot for up to 12 hours. The best thing about this item is the price point and it should very easily fit into all budgets. It seems to have a universal fit for most cup holders, and the stainless steel finish looks very expensive! The shiny cap has a low profile and it should be easy to keep track of. The bottle itself has a wide mouth on it, and the spout was designed to have an easy flow so that you can drink in motion if you need to! The vacuum sealed walls insulate and cleaning is a breeze with the stainless steel finishes inside as well. It should resist odors and flavors very well and you just want to make sure that you properly soak it after so many uses. With a 4.5 star rating, this would be the perfect mug for a shopper that’s looking for their very first eco-friendly bottle.